Having children is a privilege, one some women never get the blessing of experiencing. Once you are graced with those little toes, big eyes, and adorable coos you want nothing more in the world than to see your children safe and loved. Or at least that’s how it should be. Somehow, beyond comprehension, there are moms out there who willingly let their children suffer, and this is one of the worst cases of it yet. Answering a domestic disturbance call, law enforcement officials came upon a horrifying scene. Locked in cages like wild animals, were small children, starved and filthy. Obviously neglected and abused by their parents four little ones were rescued from abhorrent conditions. The children were discovered in an old barn that was “crudely fashioned” into a living space, CBS News reported. The malnourished children were hungry and thirsty when the deputies found them at 7:20 a.m. in Rhome, Texas, Wise County Sheriff Lane Akin commented. To the deputies shock, inside the barn was an abundance of food, but the refrigerator and the cabinets were locked so the children couldn’t eat! It would have been more understandable if the whole family was poor and struggling to feed the kids, but the parents were feasting while the kids had to desperately ignore their hunger pangs. How could any parent sit by and let their small, innocent children go through so much pain? The kids were three boys, ages 5, 3, and 1, and one 4-year-old girl. Akin said, “There was plenty of food inside the barn, but the refrigerator and the cabinets had been locked so the kids could not get in to get food,” reported CBS News. The cage the older two boys were found in only measured 3 feet by 3 feet, a deplorable living arrangement that most people wouldn’t even leave their dogs in. 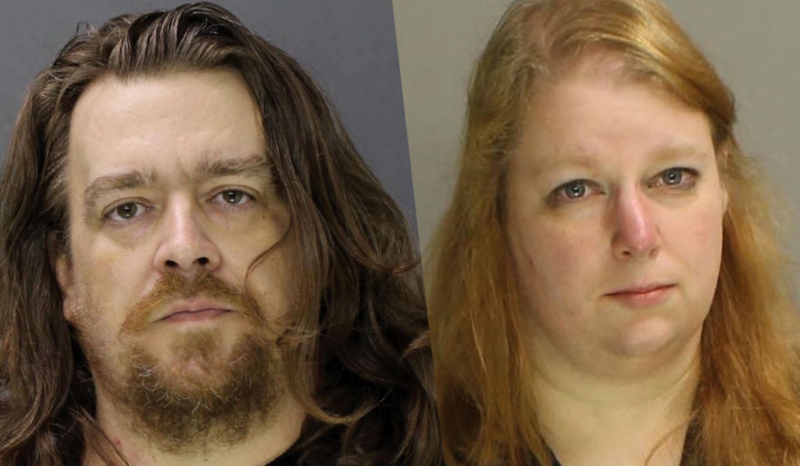 As for the other two children, they were left with minimal clothing on and feces smeared on them. Parents Andrew Joseph Fabila and Paige Isabow Harkings, 24, were responsible for the mistreatment of the children, while they should have been responsible for their well-being. According to Wise County jail records, both so-called parents are being charged with four counts of criminal child endangerment. Harkings was also charged with aggravated assault, but it is unclear why. The assault charge could be related to the multiple cuts Fabila was seen having in his public mug shot. Akin has been in law enforcement for 44 years but has never seen a case as atrocious as this one, reported The Dallas Morning News. “I’ve not worked one where children are locked inside a dog kennel, and I find that absolutely disgusting,” added Akin mournfully. The children were quickly given food and drink and then taken to Cook Children’s Medical Center in Fort Worth to uncover the extent of the damage. Sadly, the children will probably suffer emotional scars that far outlast the physical ones given to them by the people that were supposed to make them feel safe and secure. After the kids were released from the hospital, they were put into foster care, CBS Dallas reports. Neighbors had initially made the call to the police because they could hear Fabila and Harkings yelling at each other in the barn for a reportedly 5-hour time span. While law enforcement officials were questioning Fabila and Harkings they heard children’s voices in the background; thus the discovery of the wretched conditions. Harkings is the mother to all of the children that were found, but Fabila is only the father to one of them. You would suspect to see bikes and chalk outside the home of four small children, but neighbors had never witnessed any evidence of kids living next door. Amber Jester, one of Harkings neighbors, claimed she had no idea any kids lived nearby. She stated, “You’d think that, being right across the street we would know something,” reports CBS News. This wasn’t the parents first run-in with problems concerning their children. A spokeswoman for the Texas Department of Family and Protective Services said that they had seen this family before in another home, but would not elaborate on the details. It could be that Harkings moved in order to get off of the Protective Service’s radar, but it is not known for certain. Treating children in this manner should have extreme consequences, and hopefully, Harkings and Fabila will be sentenced to the fullest extent of the law. Please let us know in the comments section what you think of Harkings actions as a mother and as a fellow human being.